After work this Friday, I hopped in the car with Isla and drove us up to Manker Flats for a Friday night microadventure. As the nights grow colder with each passing day, I wanted to get one more overnighter in above 10,000ft before the temperatures drop too low to bring my furry friend along. Also, next week is daylight savings time, which means getting microadventures in after work is going to be a little more of a challenge. I knew we were in for a real treat at sunset as soon as we arrived to the trailhead parking area. The sky was filled with a twisting canvas of clouds, reflecting light in every direction. I clipped Isla into her harness, and together we took the first steps of the 4 mile and 4000ft climb to the 10,064ft summit of Mt. Baldy. One of my favorite things about hiking on Friday evenings is the lack of traffic on the trails. Isla and I covered the first 2 miles on Ski Hut Trail with only the squirrels and birds to keep us company. Isla was beaming with excitement, as she usually has to settle for a game of frisbee at the park when I finish up with work on the weekdays. Breaking up the standard post work routine on a Friday had both of us hitting our stride with an extra dose of enthusiasm. We took our first break at the iconic green Ski Hut which lends it’s name to the “Ski Hut Trail”. The door was locked up and it didn’t look like anyone would be staying there for the night. Isla still hopped up the stairs and sniffed around just to make sure. The break came at the perfect time for me, as the air was starting to get pretty cold with the sun hiding behind a thick wall of clouds. I put on my jacket, and forced Isla to put hers on as well. After leaving the Ski Hut, we cut across the gravel and talus at the base of Baldy Bowl. This is one of my favorite stretches of trail on this path to the summit of Mt. Baldy. When Isla was younger, she was a little apprehensive going through this stretch, but now she’s a boulder hopping pro. There are times I have to slow her down and ask that she stay close to me…I’m really struggling with this whole helicopter parenting thing. This was my first time hiking this trail since we got hit with a few thunderstorms last month. It was incredible to see the depth of a few new rain ruts and the amount of gravel they spewed down to the basin of Baldy Bowl. After clearing the base of Baldy Bowl, we made our way up towards the approaching saddle. Just as we were beginning to ascend the switchbacks towards the saddle, we saw our first fellow hiker…it was a familiar face. “How old are you?” he asked. I knew instantly he did not recognize me, even though this was our third time crossing paths on this very trail. I answered anyway, “I’m 30”. “Wow, you’re a very strong hiker, and you have a very good dog!” I gave my thanks and replied with the same question, even though I already knew the answer. “I’m 78”, he said. With that, I took the opportunity to find out more. The 78 year old hiker’s name is Seuk Doo Kim. He has done Mt. Baldy and Iron Mountain hundreds of times, and is from Korea. He’s also the author of a trail guide book for Korea Baekdu-Daegan. I was facing a deadline to reach the summit before sunset, but I lost track of time and spoke with Kim for quite a while. It was time well spent, and I’m glad to be able to call him a trail friend now. You can read more about Kim’s story here on the The Sheet News. After parting ways with Seuk Doo Kim, Isla and I continued on towards the saddle. We were enjoying the cool evening and pleasant evening breeze. The perfect temperature allowed us to make quick work of the uphill ascent. My shoulders were starting to feel the 7 liters of water I was carrying, but Isla’s weightless frame was free to dance around with the trees and pine cones. With only a mile left, I was feeling great about our timing for sunset, as we were on pace to reach the summit with an hour to spare. The uphill climb towards the top of Baldy Bowl is probably the toughest stretch of the Ski Hut Trail. The ground is soft and steep, and as you climb above 9000ft, your lungs begin to feel the lack of oxygen. It didn’t help that chimpmunks were buzzing just off trail, forcing Isla to blast along at a pace my human legs just can’t compete with. As the summit of Mt. Baldy drew near, we both were feeling the joy of another successful summit hike. Isla led the charge, and I did my best to stay on her heels. The views at the peak of Baldy were absolutely spectacular, with breathtaking landscapes in every direction. There was a group of students from the Claremont Colleges at the summit who took Devils’ Backbone Trail. It was cool to see a few people at the peak before Isla and I had it to ourselves. I pitched the tent and set up camp while Isla wandered around making sense of the summit. The wind was starting to blow into a new range of cold, so I bundled Isla up in her second layer, before putting a few layers on myself. I made Isla some dinner of doggy beef stew and added some warm water from my Jetboil to make it even more appetizing for her. After she had her fill, I boiled a little more water for my Mountainhouse dehydrated meals, and kicked back to eat while watching the sun sink slowly into the West. The sky lit up in the West with ambrosial hues of orange, blue, purple, and red. To the South and East, the sky sung a song of softer pinks. Earning a mountaintop sunset is a perfect life lesson. You have to put in a ton of effort and energy of the course of a few hours to enjoy a moment that only lasts ten minutes. Never have I left feeling disappointed. I settled into the night and the warmth of my sleeping bag by 8 o’clock, after some light reading and stretching. I always bring along an extra down jacket that I use as a sleeping bag for Isla. It zips up perfectly around her body, and keeps her nice and toasty throughout the night. Sometimes, I’ll even pull her into my sleeping bag if I feel the inside of the tent is still too cold. It was in the 20’s on this night with a slight breeze, but Isla fussed at my attempts to keep her warm. Just like her dad in that regard, we both run warm. We woke up at 6:30, which gave us 35 minutes to eat breakfast and break camp before a 7:05 sunrise. There was one gentleman standing at the summit when we exited the tent. I figured the downhill hike would be pretty low key and uneventful, as Isla and I made our way down Devil’s Backbone towards Manker Flats. Just as we reached the saddle after Baldy Bowl, I saw a group of 3 walking not too far ahead of us. One of the voices sounded incredibly familiar to me, but I just couldn’t place it. As we reached the ski lift just before the Turkey Shoot, Isla and I caught up. The voice and face I remembered was Tim Medvetz, a mountaineer who has scaled many of the worlds most famous peaks. I first saw Tim on a Discovery Channel reality show about climbing Mt. Everest. I loved Tim’s vibrant personality, and the drive and guts with which he forced his way to the summit. This day wasn’t about meeting Tim though, it was about meeting his group and the cause they were hiking for. With Tim was Sergeant Julian Torres of the United States Marine Corps. Julian is a double amputee and a firecracker of inspiration. He will be summiting Mt. Kilimanjaro on Veteran’s Day as part of the The Heroes Project. Take some time to read the feature of Sergeant Julian Torres, and if you’re feeling inspired, make a donation or grab some gear in the shop. You can also tune into CNN live on Veteran’s Day to watch Sergeant Julian Torres reach the summit of Kilimanjaro! Wish I was the dog! Lol!!! Stunning pictures and what a beautiful dog! it’s a wonderful place! I love your pictures! Mt. Baldy may have to go on my bucket list after reading about your adventures there. Another great post and amazing photos. Thanks! It’s one of the hidden gems of LA. I’m lucky that I can drive to the trailhead in 30 minutes. I think so! It’s always nice to meet friendly people on the trail. Wonderful post, and wonderful pictures. I’m so glad that you write about your hikes, because at least this way I can vicariously see those places too. Thanks for the kind words, and thanks for reading! Omg stunning as always! She must be the luckiest dog in the world! Wondered what camera(s)/lens/settings you used for pics? Some nice shots. I use a Sony a6000 and a 10-18mm. I do almost all of my shooting around 10mm, so I should probably just get a prime! I do my post processing in Lightroom, and have a few preset settings for a quick workflow. Interesting folks can be met on mountains! I think I just found a strong contender for my next adventure. Dog included. Thanks for the great post. Your photos are amazing. Have fun! It’s a great one! What a beautiful mountain! We would definitely hike here someday—–with our little dog. 😀 The scenery is breathtaking! Incredible depth and color in your photos – truly beautiful! Great post! Looks like you had an awesome trip! Hooray to you and your pup! I was thinking about doing a solo camp at the summit as well, and here’s my VERY silly question… It’s not likely to encounter a bear(s) at the summit, is it? I have this irrational fear of bears… I know there’s no food source at the summit, so they shouldn’t be around at the summit… but I thought I’d ask! Thanks Akiko! It’s not likely at all to see any wildlife at the summit of Baldy. I’ve seen bighorn sheep once or twice, but that’s about it. Would be interesting to know how you knew it was in the 20s for the night and what time of year it was specifically. Now it is February and an internet website says low of 33F. And there is snow there now! There wasn’t any snow in your picture, but it got down to the low 20s? How accurate was that temperature of low 20s? I monitored the temperature with a standard thermometer. I posted this just a day after the trip. I’m not sure what “internet website” you’re referring to. Mountain Forecast has the low at 23F for tonight (http://www.mountain-forecast.com/peaks/Mount-Baldy-San-Gabriel/forecasts/3068). I’ve found these forecasts to be pretty reliable. I’ve never spent the night in the snow at the summit of Mt. Baldy. You’re probably looking at weather for Mt. Baldy Village. I’m seeing a low of 37F tonight there. Just a minor 6000ft of elevation difference between the two. With windchill at the summit, it always feels much colder than the recorded temperature. Did you need a permit to backpack there with a dog? My gf and I are looking for places in Socal to backpack with our 14lbs terrier and it’s very challenging as many places won’t allow for pets. Also, did your dog have trouble breathing at the high altitude? There is no permit required. You only need a National Forest Adventure Pass to park at the trailhead. I take my dogs to the summit of Baldy at least once a month from spring to fall. Different dogs will handle the altitude in different ways. 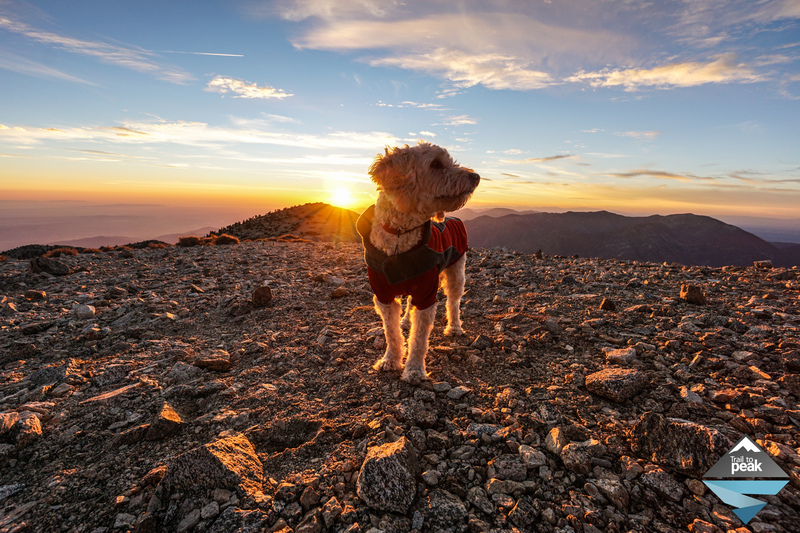 If your terrier has never been up to 10,000ft you’ll want to keep a very close eye and err on the side of caution. Great Video, and Amazing Photos! I solo backpacked Mt. Baldy this past September, but used the old trail starting in Baldy Village behind the church. Drew, I’m taking a friend who has never backcountry camped on just a quick overnighter so she can get a feel for her pack and what its like to camp light. If we plan to go at the end of June on a Saturday, do you think there will be space at the summit? What time she would plan to get there to set up camp? Are there other places we can pitch our tent if the summit is full? I think this would be a perfect experience for her since she’s day hiked Baldy before and its short enough that if she changes her mind we still have time to get back to the car. Thanks in advance for your advice! There will probably be space. The only time that it gets really crowded is 4th July. For most other nights, you’ll see two or three other tents at most. If there are a lot of people, West Baldy is always empty. I would try to arrive by around 6:00 in June. The sun won’t go down until after 8, so that will give you plenty of time to pitch a tent and enjoy the views. The hardest part about camping on Baldy is that you have to pack all of the water you will need.